When it comes to skincare, I am picky with a capital P! I'm not the kind of girl that can mix it up every single week and I can't even go 12 hours without cleansing and moisturising my skin (seriously). This is because I suffer with combination skin, meaning I get oily patches but 1cm away will have extremely dry, flakey patches. My skin can be a nightmare unless tamed by a good skincare routine. When I was approached by Botanics to be a Brand Ambassador for their new, rebranded skincare product range, I was a little apprehensive. For around 4 years I have used the same skincare products on my skin and never dared to go different, so trying new products would be an adventure. Nevertheless, I took on the challenge and, when I eventually received my parcel I was greeted with 4 products. The products that I tried out were: The Botanics Organic Hydrating Day Cream, Organic Rosewater Toning Spritz, All Bright Purifying Face Scrub, and the All Bright Radiance Balm. 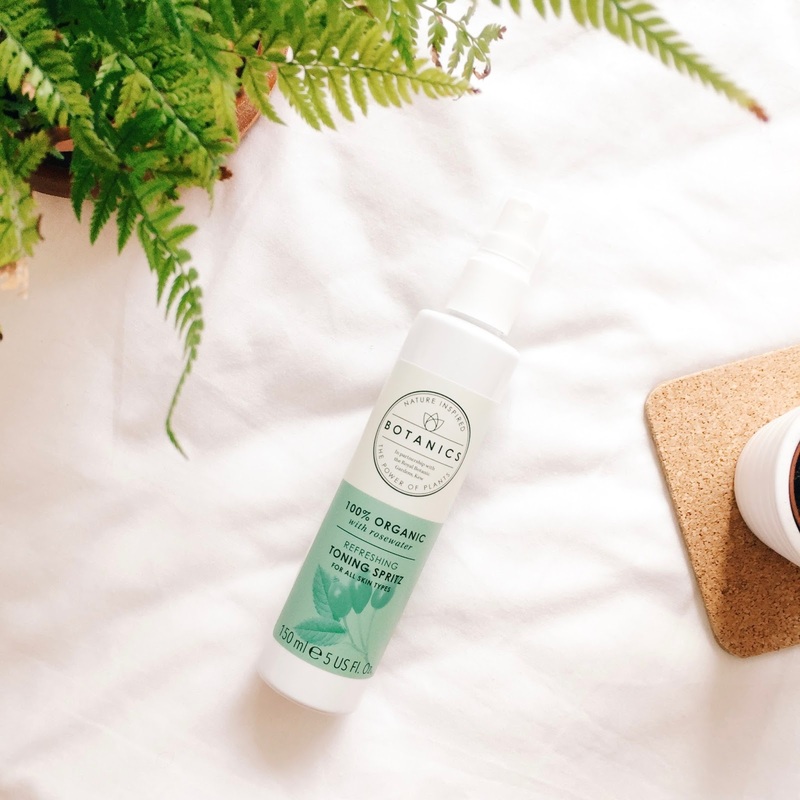 The Rosewater Toning Spritz claims to be 100% organic and, while a product's organic ingredients aren't always the most attractive element to me, this Toning Spritz contains one of my all time favourite products: Rosewater. If you know me, roses are one of my favourite flowers particularly for their elegant and fond fragrance. This toner, when sprayed over the face and neck after cleansing, just completely showers you in that gorgeous, crisp scent. While the smell of rosewater is a bonus, the power of Rosewater is almost endless and this is exactly what Botanics are promoting - the power of plants. In this case, Rosewater is one of the most powerful plants and has been renowned for it's benefits for centuries (even my Grandma swears by it). 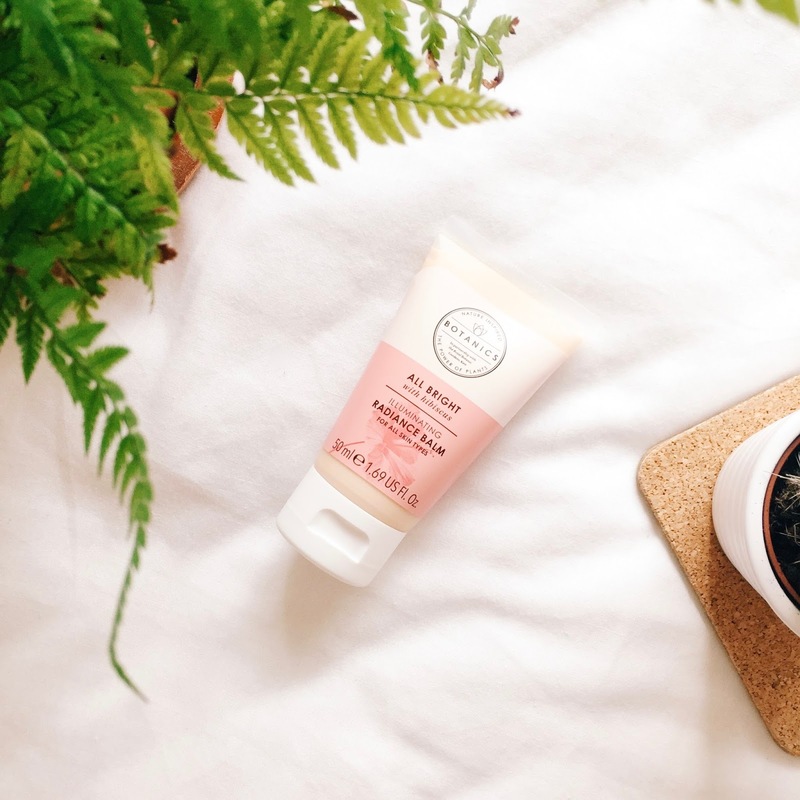 A few of it's benefits include the pH balancing of your skin, the elimination of excess oils, and cleaning pores which makes it perfect for toning your skin pre-moisturise. Personally, I haven't really found too much of a physical difference in my skin since I started using this product but I am trying new ways to find benefits from this Spritz. I plan to try using this on a cotton pad, applied gently over the face as an aid for scars and spots when I'm having a breakout day. In the meantime, I'll be over in this corner enjoying the smell of it. This toner is £7.99 on the Boots website which is really fantastic for an organic, beneficial toner. This next one was the biggest change for me - the Hydrating Day Cream. While a teeny bit less Organic, this product still contains the powerful plant of Rosehip. 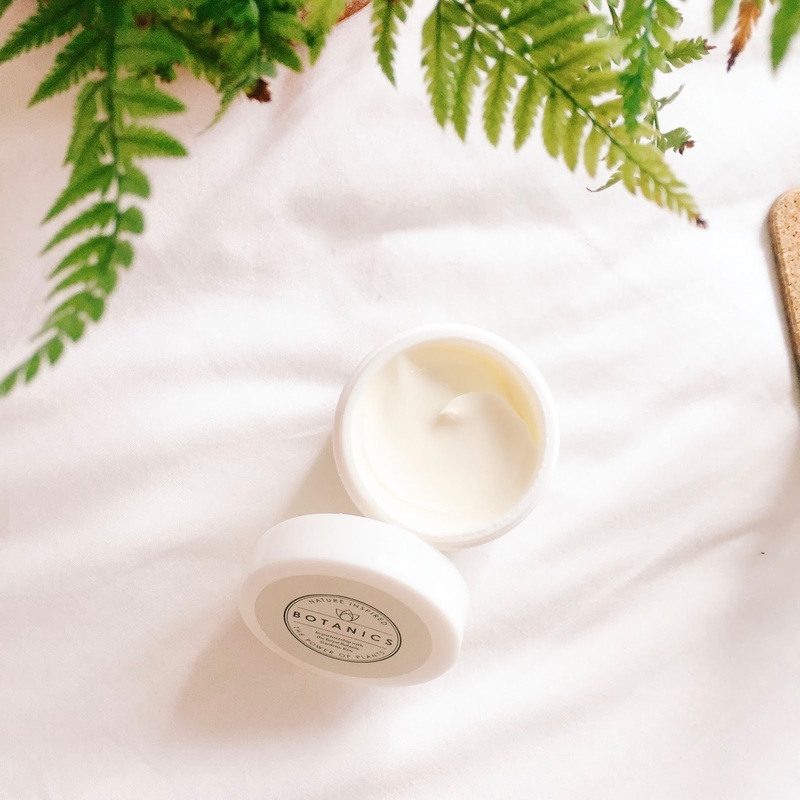 A little different to Rosewater with a slight more leafy scent (equally as gorgeous), Rosehip has essential fatty acids (perfect for anti-aging and moiturising qualities) as well as vitamin goodness. In general, the consistency of the cream is very smooth and light and a little goes a long way. The amount that I use is often a dip of the top pad of my finger and that's usually all that's required. In terms of doing it's job; I reckon it does but as someone who has very dry patches, I require something thicker and more concentrated. For me, this is great for a good skin day but, honestly, doesn't quite cut it for a deep moisturise which, unfortunately, leaves me doubtful of some of the powers that a Rosehip plant claims to showcase. 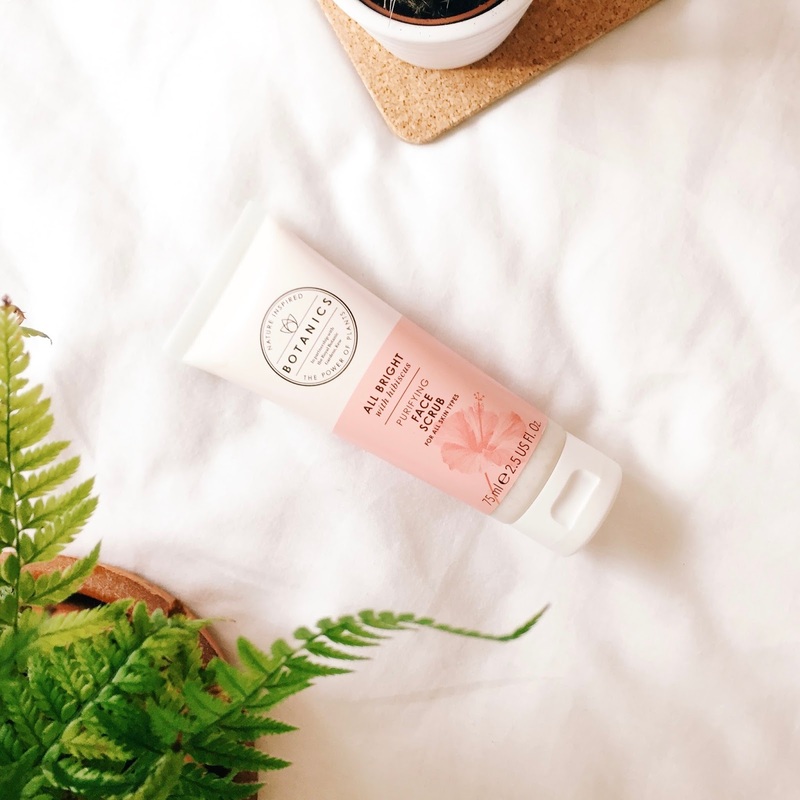 Perfect for anyone in need of a light, aromatic, fast drying moisturiser that's an easy size for travel and storage, this simple moisturiser is a simple price of £9.99. Hibiscus flower is the predominant feature in the All Bright range and the Face Scrub showcases this with it's lovely scent. But, it's far from just the scent that makes this face scrub impressive. This scrub is way ahead of the rest and contains not a single earth-damaging bead; instead, it is made up of crushed walnut shell and apricot seeds that are designed to be purifying but gentle on your skin. I really love the gentle elements of this because it's taken me so long to find a face scrub so careful but effective. Having dry skin means that there is often flaky skin on my face so scrubs are essential - I'm so glad that I can use this with confidence. My only miff about this product would be that I don't really find it brightening. Understandably, it eliminates dull skin, but I think brightening could be a long shot. For a product that only needs using 2-3 per week and only requires a small amount per use, the price of £5.49 is fab! My favourite out of all 4 products has to be the Radiance Balm. Call me a princess, but I think the main reason why I love it is because there are teeny tiny bits of glitter in it. I feel like a fairy when I'm wearing this. Radiant is definitely the word. Initially I tried it just as an additional product on my face and didn't wear makeup over it. I found when doing this that I was quite aware of the product and could almost feel product on my face. But I didn't give up. If you watch my Instagram Stories you'll know that when I first used this as a foundation primer I was BLOWN AWAY. Now, here's a thing, I'm more of a matt make-up kinda gal and never really use highlighter but this Radiance Balm has completely changed my game. I can wear matt makeup without looking flat or dull because the shine and radiance of this balm gleams through ever so slightly and gives that beautiful healthy glow. Perfect as a primer to make foundation stay, add a glow to your makeup look, and leave you looking like a fairy; at £7.99 I would definitely repurchase this. I can't wait to continue getting familiar with more Botanics products because I am so passionate and a strong believer of the idea of using nature's powers. *These products were kindly gifted to me by Botanics as I am a brand ambassador. The opinions are 100% my own and honest. I love the look of these products and have heard so many good comments! They're so reasonably priced too!! Ooooh I want to try this day cream!